KahlWax solutions can be found in a number of pharmaceutical applications, such as tablet coatings, as well as pharmaceutical creams, lotions and ointments and soft gelantine capsules. KahlWax offers a wide variety of high-quality products used in decorative cosmetics and in skin-care and hair-care products. The outstanding properties of what are referred to as the 2nd generation of modern waxes – rice bran wax, berry wax, shellac wax and sunflower wax – play a key role here: they lend products their unique consistency, and their smooth textures feel particularly good on the skin. 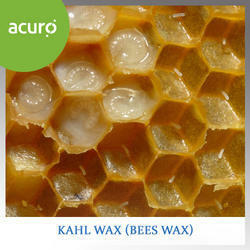 Berry wax and sunflower wax are KahlWax specialties unlike any others on the market. Kahl emulsions are extraordinarily well suited for water-based hairstyling products and sunscreen products. In both cases the films formed by the waxes result in unique product characteristics. KahlWax is also winning over clients with its high-quality, user-friendly solutions for depilatory waxes. ACUROXILL CH7 Catalysed Hydrazine hydrate is widely used as a reducing agent or an intermediate of synthesis in various industrial sectors like water treatment (effluents, industrial boilers), chemical treatment process (metals, mine extraction) or active ingredients synthesis (pharmaceuticals and agrochemicals). 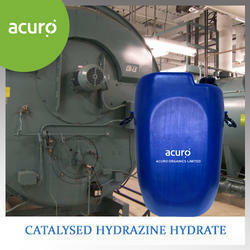 ACUROXILL CH7 Catalysed Hydrazine hydrate is marketed as a water-based solution at different hydrazine concentration. Field of applicationFor industrial uses. AXAL® PRO tablets are specially produced to obtain a very pure brine for regeneration of ion exchange resins in water softeners. 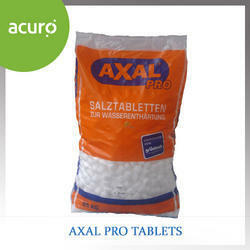 Production processAXAL® PRO tablets are obtained by very high mechanical pressure, without anticaking agent. StorageHandling and storage should be ensured under proper hygiene and preservation conditions so as to exclude any risk of contamination. Do not stack up more than 3 pallets. Disflamoll TP is a widely-used flame retardant as well as a good plasticizer, which is used in the production of cellulose acetate films. 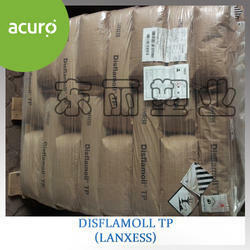 Disflammol TP is a formulated phosphate ester and a low-volatility flame retardant. Gven its high phosphorus content, it imparts flame retardance to a broad range of polymers. 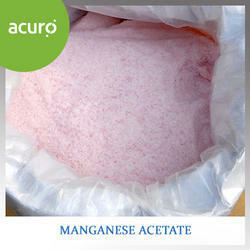 It is used as a plasticizer in the production of cellulose acetate films, and in PVC applications such as artificial leather. 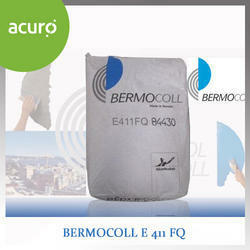 BERMOCOLL E 431 FQ is a non-ionic, water soluble cellulose ether. It improves the consistency, the stability, and the water retention of water based products. 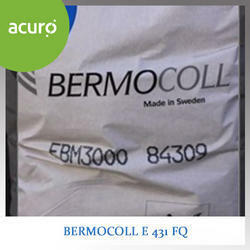 Specifications BERMOCOLL E 431 FQ is a medium viscosity grade of ethyl hydroxyethyl cellulose. Physical data Appearance whitish powder Particle size 98 % < 500Water content max 4 %Salt content max 5 % Characteristics of aqueous solutions pH (1 % solution) neutral Surface activity weak Viscosity at 20°C(Brookfield LV)1 % Solution 1,700 - 2,400 mPa. Applications BERMOCOLL E 431 FQ is used in latex paints for thickening and stabilizing effects. Normal dosage in paints is 0.2 - 0.5 % calculated on the total paint weight. BERMOCOLL E 431 FQ is used in cement based tile fix and joint mortars for improvement.of workability, consistency, water retention and adhesion. 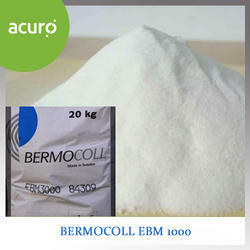 BERMOCOLL EBM 1000 is a non-ionic, water soluble cellulose ether with enhanced enzyme resistance. It improves the consistency, the stability, and the water retention of water based products. Specifications BERMOCOLL EBM 1000 is a low viscosity grade of methyl ethyl hydroxyethyl cellulose.Physical data Appearance whitish powder Particle size 98 % < 500Water content max 4 %Salt content max 6 %Characteristics of aqueous solutionspH (1 % solution) neutral Surface activity weak Viscosity at 20°C(Brookfield LV)1 % solution 500 – 800 mPa. Applications BERMOCOLL EBM 1000 is used in latex paints for thickening and stabilizing effects, particularly when high storage viscosity combined with low application viscosity is required. Spin finish oil for polyester staple fiber, this product is made via presently advanced processing techniques, which is capable of being applied for pre-spining and post-spining of terribleness, short-fibre, boasting highly satisfying neatening effect, especailly in that it makes fibre marvelously fibre-binding, cohesive, anlistating and soft, is an ideal substitude for imported oil products. 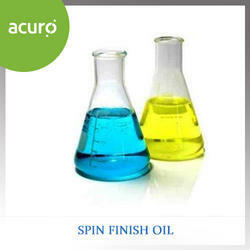 Spin finish oils have always played an important role in the processing of synthetic fibers. 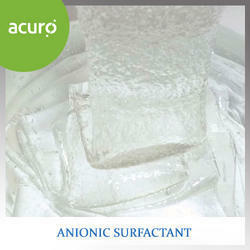 ACUROVIS CT3 is a white, slightly yellowish almost odourless waxy Cetearyl Alcohol. 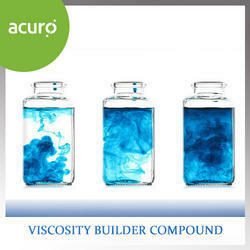 It is mainly used for viscosity regulation in cosmetic O/W. Medium crosslinked acrylic polymer. Noida Chemical offers a full range of amides derived from renewable and biodegradable vegetable resources. ACUROVIS CT3 products provide exceptional foam stability and viscosity building characteristics in bubble bath, shampoo, dishwashing, and all-purpose cleaners. 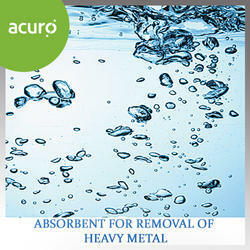 ACUROVIS CT3 is lipophilic and hydrophilic characteristics offer exceptional corrosion resistance and emulsification properties in metal lubrication and removal applications. 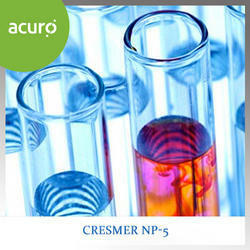 Cresmer A5 is a synthetic alcohol ethoxylate. It is an effective spreading aid and also functions as an effective emulsifier for Emulsifiable Concentrate and Microemulsion formulations. 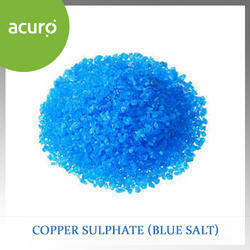 Copper sulphate is a very versatile chemical with as extensive a range of uses in industry as it has in agriculture. Its principal employment is in agriculture, and this role is described in some detail in the next section.Up to a generation or so ago about its only uses in industry were as a mordant for dyeing and for electroplating, but today it is being employed in many industrial processes. The synthetic fibre industry has found an application for it in the production of their raw material. The metal industry uses large quantities of copper sulphate as an electrolyte in copper refining, for copper coating steel wire prior to wire drawing and in various copper plating processes. The mining industry employs it as an activator in the concentration by froth flotation of lead, zinc, cobalt and gold ores. The printing trade takes it as an electrolyte in the production of electrotype and as an etching agent for process engraving. The paint industry uses it in anti-fouling paints and it plays a part in the colouring of glass. Indeed, today there is hardly an industry which does not have some small use for copper sulphate. Dustonil DP is a derivative compound based on aqueous an ionised bounding material long chain aliphatic hydro carbon surfactant suitable for open cast metal (mineral) mines Haul road, over burden area, overburden haul road & roads of mineral stock yard / pile for dust consolidation and agglomeration with Higher Moisture content, Higher Road Hardness with Better Road strength. It does not harm human / animals / birds /vegetation. 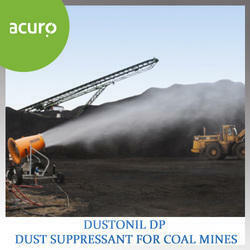 DUSTONIL DP (COAL) is suitable for haul road dust suppression in coalmines, overburden area and coal stockyard. It fulfils the rules & regulation of RCRA (Resource Conservation And Recovery ACT) of USA & CPCB (Central Pllution Control Board) & all other regulatory bodies (DGMS, CIL) of INDIA. 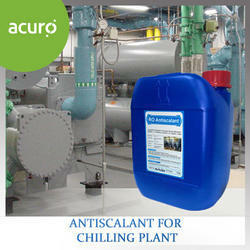 ACUCOOL AS7 is specially designed for the prevention of scale formation due to Calcium and Magnesium compounds in chilling plants / evaporators and increasing the heat transfer efficiency. 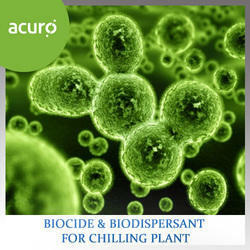 This results in the chilling plants / evaporators working for almost double the normal working time between general cleanings, greatly enhancing production rates. The general recommended dosage level is 5-15 ppm, but it may vary on the basis of water analysis . 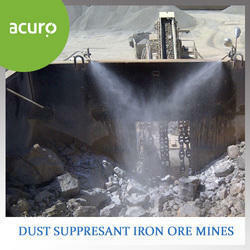 Prevents scale formation, inhibits additional corrosion and pitting . Also improves heat transfer efficiency. It reduces frequency of cleaning, life of the equipment is considerably enhanced. In areas of soft water or if stabilised chlorine tablets are used as a sanitiser in the bathing water it will be nessesary to add alkalinity to the water.Water that is low in alkalinity is corrosive to pool pumps, heat exchangers and tile grout and alkalinity builder should be used to prevent this. 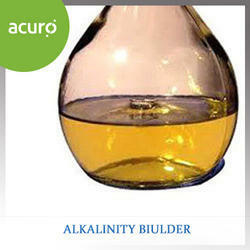 Alkalinity builder will also slowly increase the pH of the bathing water. In hard water areas the alkalinity level will already be sufficient.Alkalinity builder can be used to increases the alkalinity level in swimming pools, spas or hot tubs. To remove scale deposits from boiler/cooling tower, piping system, power plants, equipments etc is the main purpose of using ACUROCLENA CX3. All the small and large-scale industries faces number of water caused scaling problems, which are self-realized. To solve these problems and increase plant capacity we recommend the use of ACUROCLEAN CX3 before starting regular treatment of antiscalent. 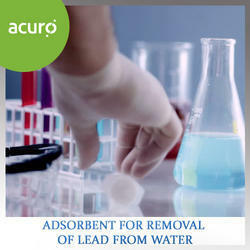 Contents of ACUROCLEAN CX3 : The product contains suitable blend of powerful de-scaling agents and specially designed corrosion inhibitors. Increases boiler/pipes capacity to its extreme level in terms of heat transfer and water circulation by removing narrowing/chalking of pipes. 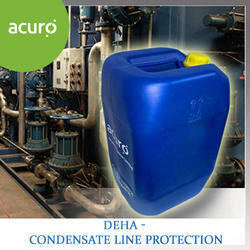 Prevents breakages, leakages of the pipes and thereby prevents accident hazard. Prevents nonscheduled and unwanted shutdown of your plant and so impro­ves profitability. 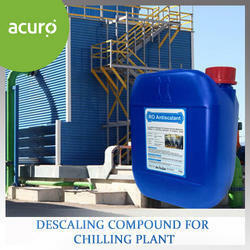 - chilling plant- evaporator- PHE plant- condensers- boilers- cooling coils- crystallizers- dehumidifiersAcuroClean SP 90 is a powerful powder descalant based on sulphamic acidthat is capable of dissolving the most stubborn industrial scale depositswithout affecting the metal.AcuroClean SP 90 contains unique inhibiting chemical constituents thatprevent the acid’s attack on the metal surface, ensuring minimum metal loss.AcuroClean SP 90 cleaning method ensures that there is minimum plantdismantling. Thus the cleaning process becomes non-disruptive andturnaround time is fast. Many industrial wastewaters contain dissolved metals as a result of their manufacturing processes. Included among them are mercury, lead, cadmium, silver, copper and chromium. Wastewater treatment systems are designed to reduce metal contaminants to meet discharge requirements and/or achieve the water quality level needed for reuse and recycling. Our water softening products remove calcium and magnesium from hard water to produce softened water. Unlike hard water, softened water will not leave any residue or scale on things it comes in contact with. The coagulation-flocculation processes facilitate the removal of SS and colloidal particles. It’s used in the first stage of solids-liquids separation: settling, flotation or filtration. Coagulation is the destabilization of colloidal particles brought about by the addition of a chemical reagent called as coagulant. Flocculation is the agglomeration of destabilized particles into microfloc and after into bulky floccules which can be settled called floc. The addition of another reagent called flocculant or a flocculant aid may promote the formation of the floc. The factors, which can promote the coagulation-flocculation, are the velocity gradient, the time, and the pH. The time and the velocity gradient are important to increase the probability of the particles to come together. Moreover the pH is a prominent factor in the removal of colloids. 1. Sodium Dodecyl Benzene Sulphonate ACUROSURF LS40 can be used as efficient emulsifying agent for polymerizing pressure sensitive adhesive. Dosage: 1-0.1%. 2. As the main content of high-class detergent and cleaner, Sodium Dodecyl Benzene Sulphonate ACUROSURF LS40 can blench, remove stains and oil and resist static electricity. 3. 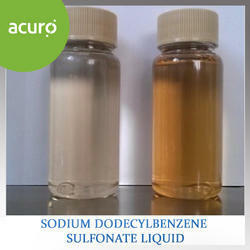 Sodium Dodecyl Benzene Sulphonate ACUROSURF LS40 can be used as the antistatic additive with cleaning function for textile oil. 4. Sodium Dodecyl Benzene Sulphonate ACUROSURF LS40 can be used as efficient antistatic agent for polyester substrate and film base, especially for polyester base cinefilm and filmstrip. Dosage: 0.5% or so. 5. 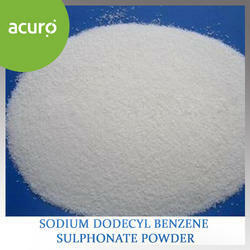 Sodium Dodecyl Benzene Sulphonate ACUROSURF LS40 can be used as the antistatic agent for polyolefine, polyester and other polymer materials. 6. Sodium Dodecyl Benzene Sulphonate ACUROSURF LS40 can be used as the anti-hygroscopic and anticaking additives for powdered chemical products that are easy to absorb moisture and agglomerate, such as methenamine, carbamide and ammonium nitrate. Adding 0.3∼0.5% of it can increase crystalline particles, resist moisture and remove static electricity so as to prevent from caking. Sodium Dodecyl Benzene Sulphonate ACUROSURF LS40 is a kind of efficient additive which can improve the quality of organic and inorganic chemical products that are easy to absorb moisture and agglomerate. 7. 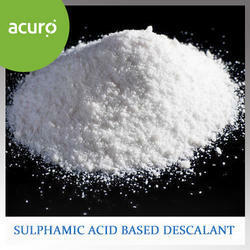 Sodium Dodecyl Benzene Sulphonate ACUROSURF LS40 can be used as good degreasant for quality leathers.